Students now have access to the first Global Navigation Satellite System antenna in Armidale. The state of the art CORSnet antenna is used by the agricultural, surveying, and construction sectors to improve accuracy for important projects. Students at the TAS School interested in a career in these industries will gain hands-on experience operating specialist technology. What is the CORSnet antenna? CORSnet-NSW is a network of permanent Global Navigation Satellite System (GNSS) tracking stations across NSW. The system, owned and operated by the NSW State Government, improves the accuracy of satellite positioning with accuracy down to 10mm. Surveyors use the system for land boundary definition and construction and infrastructure surveys. Farmers use it to guide automated tractors to perform key tasks like seed placement, harvesting, fertilising, pest control and crop monitoring. CORSnet is being used to deliver $74.1 million of upgrades to roads and bridges across the Northern Tablelands. In addition to the antenna, the school received an education package and a hand-held Garmin GPS receiver for practising mapping, navigation, distance and area measurements. TAS Headmaster Murray Guest said the school was proud to be one of only a handful to be selected for the CORSnet-NSW project. “As well as the benefits of community partnership, this will offer a great academic resource to our students; not just those in STEM (Science, Technology, Engineering and Maths) based subjects, but also promote more generally the potential of GPS technology and also, a career in surveying,” Mr Guest said. 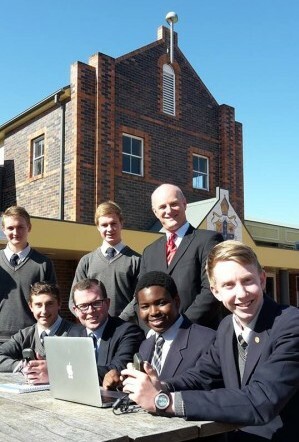 Mitch Hanlon from Mitchel Hanlon Consulting Surveyors was at the unveiling to promote surveying to students. Mr Hanlon said that there is a serious shortage of surveyors in Australia. Find out more about surveying as a career here. Member of Parliament for Northern Tablelands Mr. Adam Marshall visited The Armidale School to inspect the new CORSnet antenna. Visit his website to read more about it here.